The images that have been circulating on social media of people burning things that are said to be already cast ballot papers are true but the things being burnt are not cast ballot papers, FaceofMalawi can reveal. 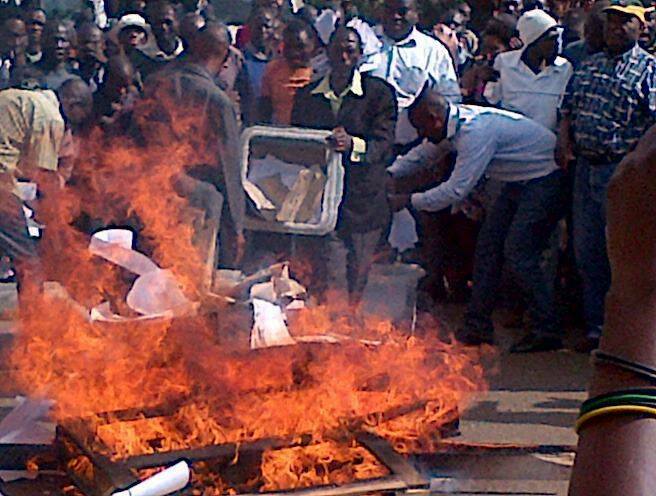 Malawians in Lilongwe this afternoon descended at the civic offices in the Capital city demanding that they set ablaze the materials which they said were already cast ballots. However, the materials that were seen by FaceofMalawi were nowhere near to ballot papers let alone already cast ballot papers. From Yesterday, stories have been circulating that President Banda’s rigging team had been transferring ballots marked in Banda’s favour to various centres in Lilongwe district. Malawi Electoral Commission has, however, assured Malawians that ballot papers are safe and these elections will be free and fair.